Spring is finally here to stay. The weather is warming up, the sun is staying out later and later, and we’re beginning to see wildlife flit around outside. Amongst the blooming flowers and buzzing bees, sometimes you can even spot a butterfly perched nearby. Butterflies come in all shapes and sizes, but the most striking difference between them can be seen clearly in the colors and patterns of their wings. But, why are there so many different types, and why on earth do they all look so different? 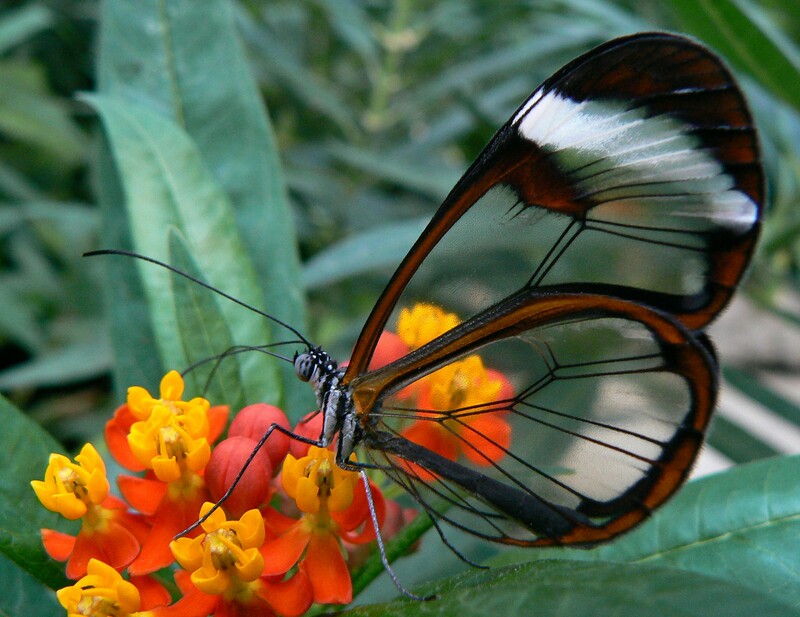 Butterflies often use their wings as a way to communicate with each other. Sometimes, they can use this as a warning sign, telling others to stay away. For example, the orange, black, and white pattern of the beloved monarch butterfly warns predators such as birds that they won’t taste good if eaten. Another species, the viceroy butterfly, even mimics this pattern to trick predators into staying away! In this way, viceroy butterflies can avoid becoming someone’s next meal, even though they might actually taste good. Bright coloring may also be used to attract mates! Other species of butterflies and even some moths can use their wing colors as a source of camouflage or deception. Certain species have large circles or “eyespots” on their wings that can trick predators into thinking it is a larger animal (like an owl). Others may have patterns that look like leaves or tree bark so that they can easily hide themselves. Even human beings can influence which patterns are popular! The most famous example of this was seen during the Industrial Revolution. Before, there had been one species of “peppered moths” that had lightly spotted wings that camouflaged the moths on tree trunks. However, once factories emerged and dark clouds of soot polluted the skies, tree trunks began to darken. These light-colored moths would now stand out very obviously against the tree trunks and would be quickly eaten by birds. 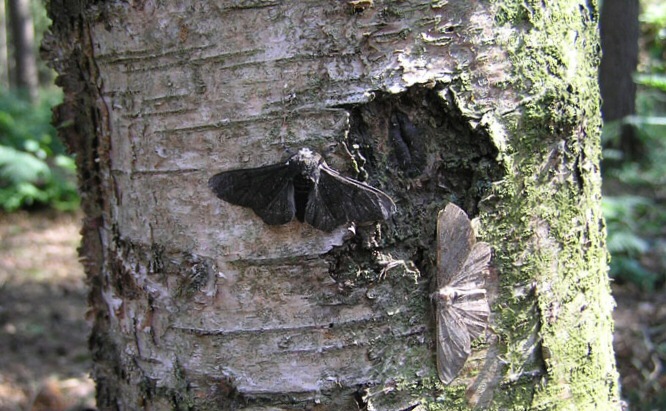 Because of this, only the peppered moths with dark wings that matched the darkened tree trunks could be camouflaged and hidden from birds. Through this process of “natural selection,” peppered moths with dark wings started to quickly outnumber those with light wings! Wing patterns often differ between males and females, as well. In very rare circumstances, some butterflies and moths can develop to have one “male” wing and one “female” wing. These “gynandromorphs” (“gyne,” female + “andro,” male + “morphe,” form) can have two drastically different wings, very obviously displaying how different the two sexes may look! So, how do these different patterns develop in the first place? It turns out that butterfly wings are made of just a single layer of cells, and that the pigmentation or color of these individual cells is what gives wings their patterns and appearance. These cells form overlapping scales (similar to those on the surface of fish) to help in flight, coloration, and even “iridescence” – the phenomenon by which wings can appear different colors based on which angle you look at them from! Scientists have even discovered single genes (pieces of an animal’s DNA) that are responsible for single colors, bands, or areas of a wing’s pigmentation! By manipulating these genes, scientists have been able to not only understand how these wing patterns are made to begin with, but also how to create their own patterns, essentially “painting” on colors in stripes with genetic tools! 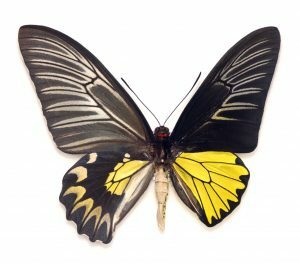 There are many questions still surrounding butterfly and moth wings, and even those of other insects such as flies and bees – why exactly do they have different shapes, why is there such great diversity, and how is such diversity created at the cellular level? With each observation, discovery, and experiment, we are learning more and more about these phenomena, but perhaps for now, we will have to settle for merely appreciating nature’s beauty as it is.